This time of year I convert from CEO to CLO, Chief Listening Officer. In the last two weeks we visited with three accounting schools, hosted a Maryland Managing Partner call, and held our first town hall for our Business & Industry members (CFOs, Controllers and management accountants). Last night we (Our membership manager, Rebekah Brown) and I visited with the University of Maryland Smith School of Business and the student business club (pictured). Seventy-four percent of them were accounting majors and eighty-six percent of them plan on getting their CPA. We also caught up with three of our educator members (and two life members), James McKinney, Gary Bulmash (Gary is club adviser), and Stephen Loeb. We used our conference participation app, conferences.io to poll the group and get feedback. Using their smartphones, they responded with lightning speed! Opportunity for Advancement and Development – This is the career path emphasis we have been talking about. Work / life balance – This continues to be a very important issue. Meaning and purpose in their work and in the organization. We talked about our pipeline initiatives and our first annual Student Leadership Academy scheduled for June 25-27th at Towson University. It is free for accounting students and they can apply here. We are also looking for CPA firms and employers to sponsor this and get to know these students in a exciting environment. For more information for students visit our Tomorrow’s CPA website follow us on twitter (@macpa, @tomorrowscpa). 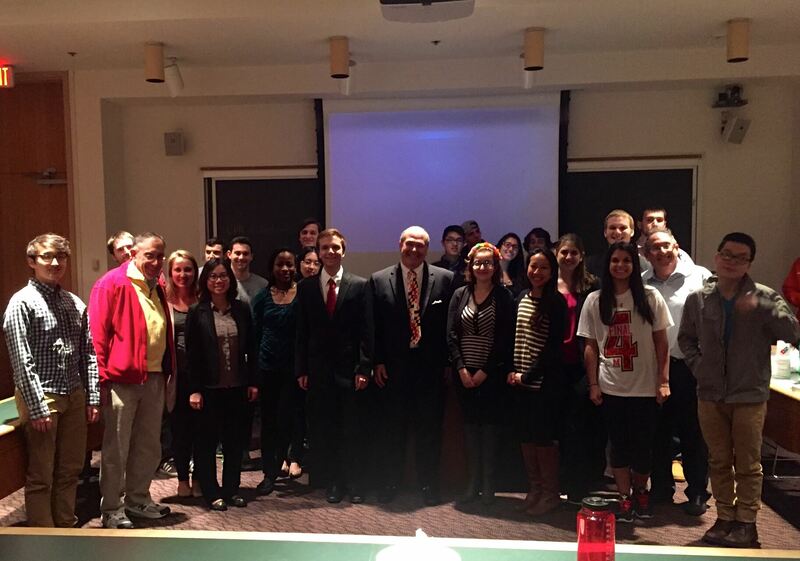 To all of the accounting students last night and all across Maryland, we are listening and we wish you much success in your future careers as CPAs!